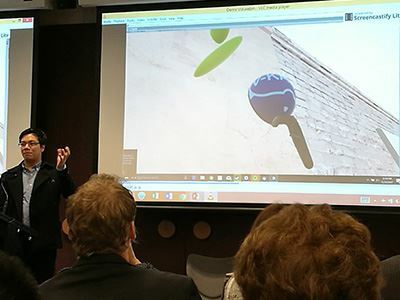 Innovation, changes, disruptive, VR, AI, problems, solutions and passion - these were the words that were bandied about at the Innovation - Solving Big Problems for Australia-Japan event on Thursday 25th May. 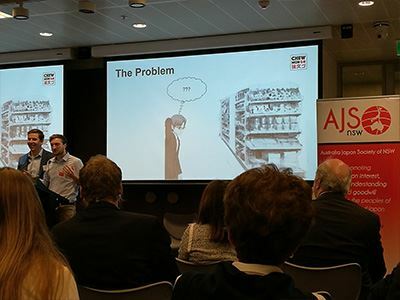 The full house event was held at the event sponsor and AJS-NSW corporate member PwC’s latest ‘hot desk only’ office in Barangaroo which was an apt location for the forward thinking speakers to showcase their startup venture progress so far. The leader of PwC’s Japan Practice in Asia Pacific (ex Japan), Jason Hayes reminded us that we all have a responsibility to talk more about innovation as it is the keyword for the Australia-Japan relationship since Prime Ministers Abe and Turnbull signed an MOU on Innovation, Science and Technology in December 2015. He continued by providing guests with an overview of the current Japanese startup scene, the challenges it faces and the unique opportunity between Australia and Japan startup environment. With our Vice-President, Anita Byrnes, Jason is one of the mentors at Innovation Dojo, the program that brings together a diverse group of young entrepreneurs and Japanese speakers to learn and work together on business ideas that would contribute to both cultures. The ideas from Innovation Dojo’s startup groups were nurtured and accelerated through their mentorship that culminated in a pitching competition with the top teams winning a trip to Japan to refine their plans at the end of last year. 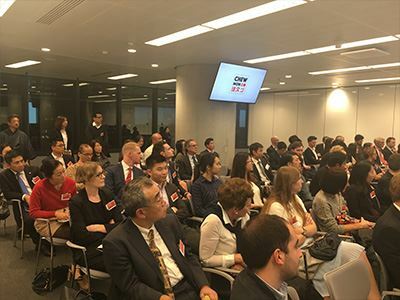 Out of the seven startup groups, three are ready to be fully-fledged businesses and of the two rising stars, V-Kaiwa and Chew Mon Go spoke about their intelligence and market sounding missions to Japan and their venture experiences to date. V-Kaiwa is a startup with a burning desire to solve the critical problem that many Japanese face - the lack of proficient English speaking skills. V-Kaiwa have found their solution: by making learning English fun and interactive with a help of virtual reality (VR) technology. The team of four has been making huge progress. Although the team found Japanese business “brutal” and reluctant to share information due to overall high competency and high competition, they’re solidifying their idea by building their VR world. Furthermore, V-Kaiwais is on the quest to scientifically prove that VR really does improve spoken language development. With a vision to solve another common pain point, ChewMongo aims to turn the often mysterious and frustrating Japanese food experience into a safe yet adventurous journey utilising artificial intelligence (AI). Aiming to launch in time for Tokyo 2020 Olympic, the duo are creating an easy to use AI app that quickly and accurately ‘decodes’ the complex nutritional and ingredient label on all Japanese food products. In contrast to V-Kaiwa, ChewMongo felt that Japanese businesses did not share honest feedback with them during their Japan trip. However, they found interactions at events such as Innovation - Solving Big Problems for Australia-Japan an invaluable opportunity to refine their product and test their concepts. In a short amount of time, both V-Kaiwa and ChewMongo have made a dramatic advancement to their ventures. We wish them as well as the other Innovation Dojo startups all the best and we look forward to try out their innovative products! The event wrapped up with lively Q&A and networking session that was sure to have fuelled the guests’ creative juices – are you ready to innovate?